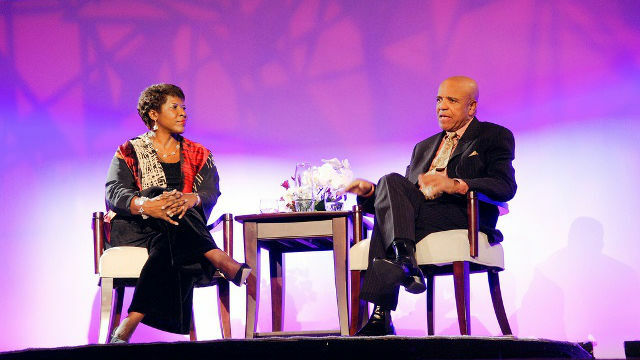 An Evening with Berry Gordy premiered January 2013. A look at the celebrated life of Motown musician Berry Gordy. An Evening With Berry Gordy provides a rare inside look into the life and times of boxer, songwriter, producer, movie director, entrepreneur and Motown founder Berry Gordy. This one-on-one interview was taped in front of a live audience at the Art Institute of Chicago with PBS-TV journalist, Gwen Ifill, serving as the host interviewer. The audience comes to its feet immediately at the show’s beginning when Berry Gordy dances his way onto the stage. With an interview that is both informative and entertaining, Gordy starts by describing his early interest in songwriting at the age of seven. He then surprises and delights the audience as he plays his first composition, “Berry’s Boogie Woogie”. Backed by American Idol’s Ray Chew and his band, the program features live musical performances by Valerie Simpson (“I’ll Be There”) of the legendary Motown songwriting team of Ashford & Simpson. Other performers include Motown artist KEM with Marvin Gaye’s “What’s Going On” and singer/songwriter Janelle Monáe with the Jackson Five’s “I Want You Back”. The performances of Brandon Dixon and Valisia LeKae who play Berry Gordy and Diana Ross, respectively, in Motown The Musical “To Be Loved” and “You’re All I Need to Get By” had the audiences wanting for more. Gwen Iffilll and Berry Gordy. Image courtesy of The HistoryMakers. Intermixed in the show are live appearances from National Newspaper Publishers Association president, Danny Bakewell, who describes Gordy’s groundbreaking accomplishments and Reverend Jesse Jackson who tells of Gordy’s importance to Reverend Martin Luther King, Jr. and the Civil Rights Movement. Suzanne de Passe, his longtime friend, business associate and mentee, had the audience laughing aloud as she tells of their work together and his role in putting women in leadership positions. Others provided their perspectives on “The Chairman” and his Motown Legacy. They include: Quincy Jones, Stevie Wonder, Smokey Robinson, President Bill Clinton, Edgar Bronfman, Leon Huff, Kenny Gamble and Sony Music’s Doug Morris and Marty Bandier. Berry Gordy’s story is one of legends. With an $800 loan from his family, he formed his own company – Motown Records after a chance meeting with Smokey Robinson. Headquartered in a house on Detroit’s West Grand Boulevard,in 1960, Motown released Smokey Robinson’s Shop Around which sold more than a million copies and helped to launch the most influential artists of the twentieth century: Diana Ross and the Supremes, Martha Reeves and the Vandellas, The Temptations, The Four Tops, Stevie Wonder, Gladys Knight and the Pips, Marvin Gaye, Tammi Terrell, Mary Wells and many others. This program was videotaped as part of the annual celebrity interview and fundraiser for The HistoryMakers, a 501(c)(3) Illinois, not-for-profit corporation. The HistoryMakers, the nation’s largest African American video oral history archive, is committed to the development of a unique on-line archive of 5,000 first-person narratives of African American HistoryMakers, both well-known and unsung. When completed in 2017, the archive will represent the largest single one of its kind in the world. An Evening with Berry Gordy was produced by Julieanna Richardson, with co-producers Suzanne de Passe and Charles Randolph-Wright. The show's music producer is Ray Chew.